The Supreme Court has reiterated that arbitrator cannot award interest on award if the agreement expressly prohibits grant of interest. 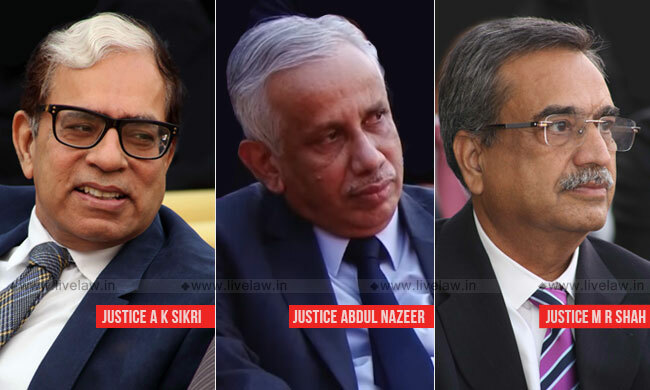 The bench of Justices A K Sikri, Abdul Nazeer and M R Shah dismissed an appeal to uphold a judgment of Delhi High Court, which had set aside an arbitration award to the extent it granted interest overlooking the prohibition in the agreement. The appellant was a contractor, who had entered into a works contract with Tehri Hydro Development Corporation of India Ltd.
Clauses 50 and 51 of the General Conditions of Contract (GCC) between them expressly stated that no interest will be payable to the contractor on the money due to him. Despite this express prohibition, the majority of the arbitration tribunal awarded interest, relying on SC judgment in Board of Trustees for the Port of Calcutta v. Engineers-De-SpaceAge, which had held that arbitrator's power to award interest as per general principles of law was not stifled by terms of agreement. The HC set aside the award to the extent it awarded interest. This led the contractor approaching the SC. The SC noted that Section 31 of the Arbitration and Conciliation Act made the power of arbitration tribunal to award interest subject to the terms of agreement between parties. "Section 31(7) of the 1996 Act sanctifies agreements between the parties and states that the moment the agreement says otherwise, no interest becomes payable right from the date of the cause of action until the award is delivered", observed the judgment authored by Justice Sikri. The SC agreed with the conclusion of HC that the judgment in Board of Trustees for the Port of Calcutta was not applicable, as it was a case under 1940 Arbitration Act, which did not have a provision similar to Section 31(7) of the 1996 Act. "At this stage itself, it may be mentioned that in case clauses 50 and 51 of GCC put a bar on the arbitral tribunal to award interest, the arbitral tribunal did not have any jurisdiction to do so",the SC held. The SC also held that the judgment in State of UP vs Harish Chandra & Co case was not applicable, as it was rendered under 1940 Arbitration Act. It was noted that this judgment was explained and distinguished in Sayeed Ahmed and Company case. "In this scenario, when we find that Harish Chandra case which is of the vintage of 1940 Act and is distinguished in Sayeed Ahmed and Company coupled with the fact that the ratio of Sayeed Ahmed and Company has been consistently followed, there is no reason to deviate from the construction to Clauses 50 and 51 of the GCC given by the arbitral tribunal in the first instance as well as the High Court"
The bench also noted that a 2017 judgment authored by one of the members of the bench (Justice Nazeer) in Sri Chittaranjan Maity v. Union of India case, and also a 2016 decision of a three judges bench in Union of India vs Ambica Constructions had taken the same view. It further noted that exactly same clauses of contract was interpreted by the SC in Tehri Hydro Development Corporation (THDC) Limited & Anr. v. Jai Prakash Associates Limited to hold against arbitrator awarding interest.